Coordinate various departments to implement various oracle modules and upgrade all present modules and develop effective strategies to enhance all Oracle Applications. Analyze all client requirements and use of Oracle for organization business and implement various applications according to same and develop various Oracle processes and ensure optimal satisfaction of all users. Prepare estimate of all projects and ensure effective working of all implementation activity and evaluate all functional documents as prepared by Oracle Implementation Team and ensure compliance to all standards for deliverable documents. Analyze various business scenarios and monitor all project slippages and redesign various new processes for all Oracle applications and customize same to ensure compliance to all business processes. Monitor and implement all applications according to requirements and maintain project to enhance all productivity of applications. Coordinate with application architect and develop all project milestones and ensue compliance to same and monitor all projects and implement all applications according to standard processes. Assist team members on all oracle applications and provide required training to staff and customize processes as per client requirement. 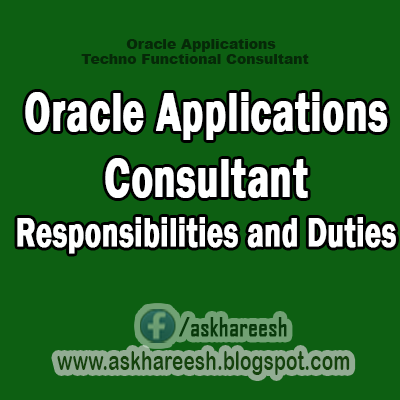 Provide consultation support to all Oracle developers and documents all revision requests and coordinate with end users to analyze all application requirement. Monitor and resolve all application issues and escalate issues to management if required. Administer all technical assistance requests and implement plans and perform quality assurance tests. Perform all functional acceptance tests and provide upgrades as per requirement and perform troubleshoot to all processes.